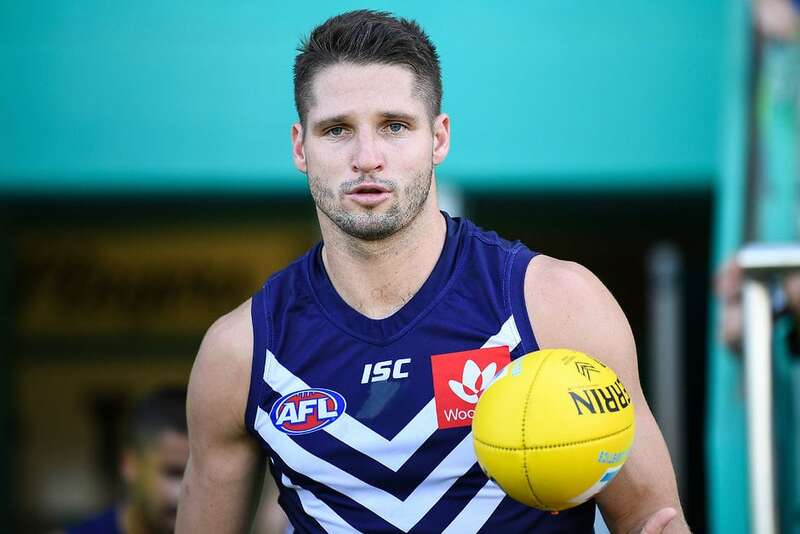 FREMANTLE'S marquee recruit Jesse Hogan has been ruled out of round one as he manages clinical anxiety. Hogan was expected to make his Dockers debut against North Melbourne at Optus Stadium as part of a new-look forward line alongside ex-Giants big man Rory Lobb. However, the former Melbourne star missed a training session on Sunday after making "poor choices around alcohol consumption on Saturday evening" and won't face the Roos. There is no timeframe on his return to football. "Jesse will not be available for selection for Sunday's game against North Melbourne at Optus Stadium while he focuses on his personal management of clinical anxiety," general manager of football Peter Bell said. "The club has been aware of Jesse's clinical anxiety and has wrapped the appropriate support measures around him and will continue to do so. "Jesse made poor choices around alcohol consumption on Saturday evening prior to our training run at Optus Stadium on Sunday and as a result he did not take part in training. "Jesse's circumstances have been shared with club leaders and the player leadership group. "The club and our playing group are united in continuing to provide all the necessary ongoing support to Jesse, and we are not putting a time frame on his return to playing." Bell declined to reveal when the Dockers were aware of Hogan's clinical anxiety, but said he had the club's full support. To Bell's knowledge, Hogan is not battling any physical injuries and said the forward was not in a "condition to train on Sunday". Hogan's unavailability for the North Melbourne contest leaves Fremantle thin for tall forwards, with Matt Taberner and Brennan Cox both sidelined by hamstring issues suffered eight days ago. Yet-to-debut youngster Hugh Dixon (hip) and swingman Shane Kersten (foot) are also not expected to be available. The door is suddenly wide open for previously out-of-favour Cam McCarthy, who wasn't picked in either JLT Community Series match against Collingwood or West Coast. McCarthy has booted 44 goals in 36 games since crossing to the Dockers at the end of 2016 after taking a year out of football, but looked set to be squeezed out of the line-up early this season after Hogan and Lobb's arrivals. Hogan agreed to a move back to Perth during last year's NAB AFL Trade Period after being wooed by the Dockers for several seasons. Negotiations between Fremantle and Melbourne were tense but a deal was eventually brokered for the 2015 NAB AFL Rising Star, who booted 152 goals in 71 appearances for the Demons. Fremantle parted with picks six and 23 in exchange for the 24-year-old and pick 65, securing a long-sought replacement for club great Matthew Pavlich in attack. Hogan, who was diagnosed with testicular cancer in 2017 only weeks after his father Tony's death, arrived at Fremantle with a navicular stress fracture in his right foot. But the mobile 195cm big man made an excellent recovery from the injury and played in both JLT matches, seemingly putting him on track for round one. Fremantle has a long list of players on the sidelines heading into a crucial 2019, including experienced trio Stephen Hill (quad), Connor Blakely (hamstring) and Aaron Sandilands (calf). Small forward Brandon Matera is also suspended for round one after striking Eagles forward Jake Waterman in the final practice match. In better news, emerging defender Griffin Logue (hamstring) is aiming to put his hand up to face North and wingman Bradley Hill is set to play after overcoming a corked calf.